The thing that made my jaw drop, though, was number 17. The decision to identify the Flammable Chemicals Storage building seems like a dubious one to me. 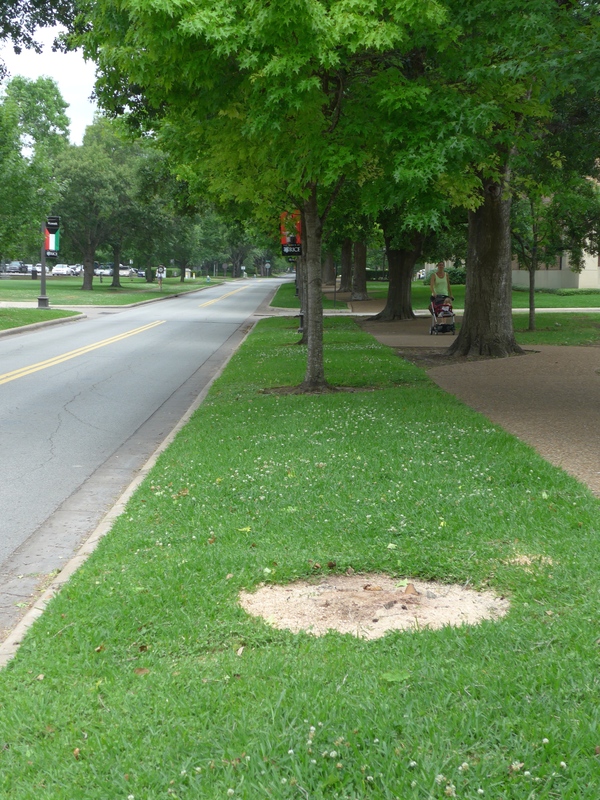 Bonus: It looks like we lost another tree last week in addition to the Pershing Pecan, this one unlamented but equally dead. They may have needed to deliver chemicals there. Parts of the map are hand-drawn. There is a signature, “Maurice Lewis”. It is just below the label “Sunset Boulevard”. There’s no Alice Pratt Brown Hall (ie, Shepherd School) so it must be pre 1991. Ah! Beautiful! That’s a much better range. There is no George R. Brown Hall which makes it at least a year earlier than that. Also, Allen Center is still flat roofed and three stories which I’m pretty sure subtracts another year. Is building number 17 the small white building visible in the background, behind the greenhouses, that we discussed in the January 15 post? This is before the RMC basement fire, as the Band Hall is still listed as part of the RMC. This looks exactly like the campus I remember, except I don’t remember the tennis center being labelled “Jake Hess Tennis Stadium” when I was there. Still, I went to Rice from Fall 1983 to Fall of 1987, and this is what I remember. Also, they opened Gradlands in 1987. They started running a shuttle bus in 1986. Don’t know when that would show up on campus maps. And the entrance at University and Stockton was still labelled “Entrance 7”. And there are no buildings on the west side of Entrance 7; there were buildings there when I visited campus summer of 1994. And, as I look, The Graduate House is indeed listed. I think that 1987 is a good guess for the year for his map, but would believe 1988-1990. My guess is that the drawing was made just before 1986. 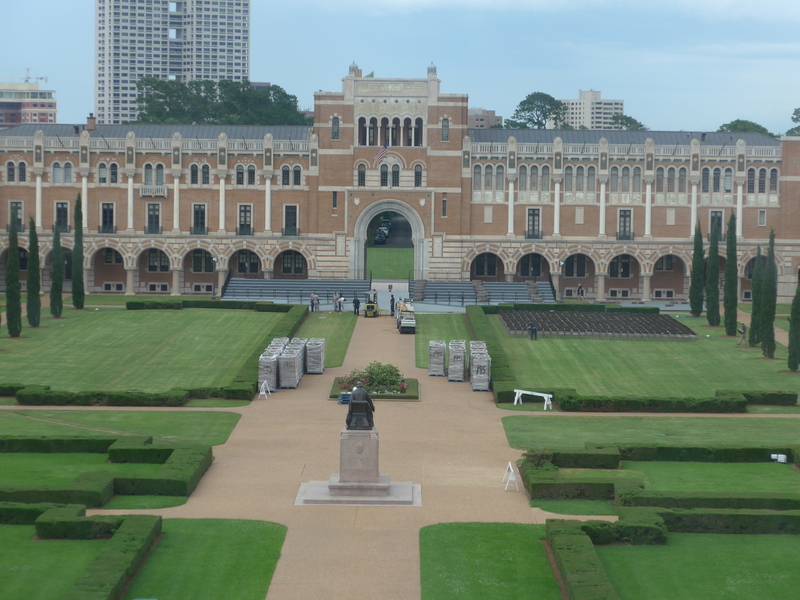 The reason that the Ley Center is not in the index is because the whole complex was called the Rice Memorial Center before the additional space was added on the west side. I don’t see the circular driveway on the west side, so I suspect that this drawing was done during or before when the Ley Center renovations were added. Audrey Ley might know better than me. I don’t know if she will be at tonight’s baseball game with UH because they play all the way out in Sugar Land. Yes, I agree with Steve. The earlier the better. The Shepherd School offices were still in Sewall until 1988, I believe, when we moved to the fifth floor of Fondren. I clearly remember calling my future wife from my tiny office in Sewall Hall to ask her out on our first date, and that would have been December, 1987. This map is published in grayscale in the 1985-86/1986-87 General Announcements, near the front. A quick look at the ’81 book shows a similar but clearly earlier map. The General Announcements archives online may make it easier to pin down the date, if someone really wants to compare the versions. I knew I’d remembered seeing a map like that while I was there! I was thinking it was in the book listing courses, but wasn’t sure whether I was just imagining it. That would explain the small discrepancies. If it was being updated each year, then it’s possible that some small details were missed, then corrected in later years. This picture looks strikingly familiar. 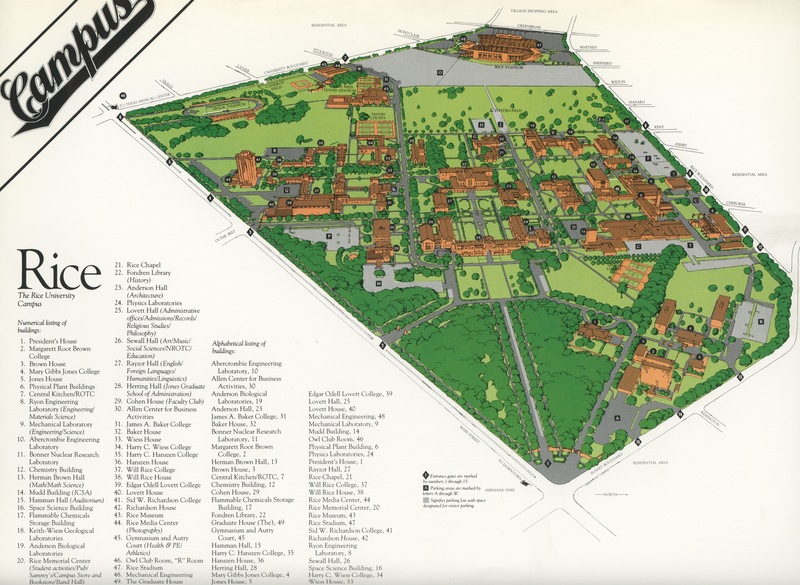 I matriculated in 1988 and this map looks exactly as I remember the campus being then. I matriculated in 1987 and am pretty certain that was the map I was intriduced to (and used) either that year or the year after. I think marmer01 has it from the General Announcements, which would make sense. But I seem to remember it as a stand-alone print on glossy paper. This picture is indeed a stand alone on glossy paper.